We are once again offering our ongoing course in the fundamentals of Qigong. 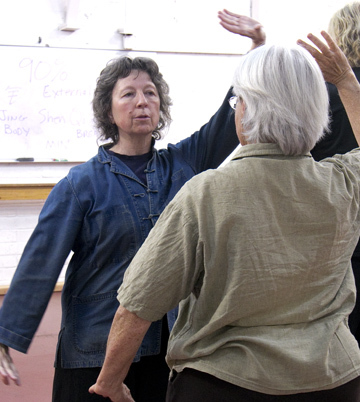 This survey style course will offer diverse Qigong principles and methods. For instance, one routine will give you the feeling of practicing Tai Chi (or enhance the Tai Chi you are already doing). Another is a seated method from Daoist temples that can be done walking or lying down. A third is an ancient form based on Five Animals. This extraordinary class will be led by Narrye Caldwell. Having practiced Qigong for decades, as well as being a licensed Chinese medical doctor and teacher, Narrye gives a presentation of solid understanding for these traditional and beautiful forms. This class is for beginning and intermediate students, approaching these valuable methods with a sense of focused intent and personal discipline. This is a vigorous training and not a “space dance” with pretty but ineffective movements. Most forms will be presented in four to six weeks installments. Students may pause in their training at the finish of an installment. Class meets weekly and will run monthly until…? Can be joined at any time.